Talk about your set up, ask for help choosing a set up, and talk about everything to do with longboarding, here! I'm going to try periodically updating this threads original post with more info, in case there are any start ups coming in this thread looking for general info. Want some slide gloves? I'm not going to post up the links for the ones on the market, you can search those yourself, but I can tell you how to make some cheapo ones, that work just as well! 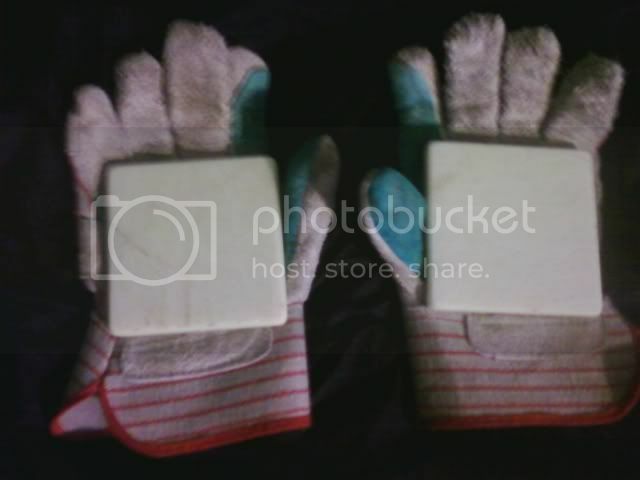 All you need is some work gloves, some hot glue, industrial velcro and some Corian. Now, work gloves, hot glue, and velcro are easy to find, corian, however, might be a little more difficult if you don't know where to look. This site lets you get up to 6 free pieces at a time, that's enough for 3 pairs of gloves, compare that to spending around 15 dollars for two slide pucks for one pair of gloves. Constructing your gloves from there is fairly simple, glue one part of the velcro to the glove, the other to the corian, then stick it on. Not pretty, but they get the job done. Some people like having pucks on their fingers, I just tape up the middle and index fingers with electrical tape when they start to tear. longboardsk8r has a lot of completes in the $200 range, not all are set up the way I would want but tastes vary......my choice for an all in wonder would be something like this and a set of freeride wheels (like Zombies, Sidewinders or Slide B's) to switch to when you want to get your slide on. Good online stores include Mile High skates, East Coast Core Skates, and Longboard Skater, Something to think about, Longboards are built in batches and designs are constantly evolving. What ever you do invest in or build a pair of gloves they are as important as your board and shoes. Also you will find that a large percentage of longboarders wear a helmet. Helmets don't have the stigma in longboarding that they do for streetskating not to mention many of us know someone who has been hurt or died because they weren't wearing one. something else to think about....Concave. There are two very different types in the longboard world. Radial and the so-called lunchtray. Most of the boards pressed in Socal (Watson for instance) use a some variation on a Radial concave. Gravity, Earthwing, Sector9 and TuTone (there are numerous others) all have similar concaves (not that that is a bad thing). Then there is the Lunch Tray concave, relatively flat in the middle and scooping up on the edges, these are usually produced by small to midsized companies that do their own fabrication. Rayne, Landyatchz, Kebbek, Comet, Madrid, SodaFactory and there are others, all use some variation of the lunchtray, it takes more time to perfect and usually requires a mold for each type of board instead of a common mold that can be used for many types of board. The difference is that while radial concave hold you on the board Lunchtray hold you in. Of course lunch tray boards tend to cost more to make. 4th Update: Going to list some board companies, followed by truck companies, then wheel companies. I'll list their websites and youtube accounts underneath, this is a big update, and I know since I'm going by an online stores list of companies I'll miss a few companies and will need to add to this list. Enjoy! And feel free to tell me to add anything I've missed. I know you "get what you pay for", but my experience with the Spinlite drop down I have is that it's a solid board. No flex, ten ply, and just solidly constructed. Warning on the blank trucks from the Spinlite store, the bushing seats are weird, the kingpins are incredibly short and the stock bushings are just strange. Longboarding is very expensive, so I'm not going to lie, I advise getting a cheap set up and slowly buying better stuff and upgrading your setup, if you don't have the money to spare right away for an amazing board. Churchillmfg seems to have a decent reputation on Silverfish, and as they're a community that won't hold back from shunning a company, I'd say that's a good sign. That's about it, enjoy! Last edited by TGIMUNDAY; 03-04-2012 at 12:04 PM. Found the freeride video I was looking for, thanks to one of the guys on Silverfish. If you guys have any suggestions, or want to post up some more stuff, feel free! I'm still a bit of a noob, so any help is appreciated. i've always wanted a longboard. probably will buy one when i'm older. Ridden one once, and it was the awesomest thing ever. All I can say, is get one. Check out the first video posted up there. So sick. I need to figure out which Is best for me. Shape, etc. Well, I'm assuming you're a regular shortboarder first, like me. I have a thing where I want a symmetrical board, so you should maybe look at some freeride boards since they're generally shaped like that. If you're just looking to cruise that wouldn't be as big a deal. Haha, well, I'm riding a Comet FSM right now and I love it and would recommend it. Some people have had problems with it delamming and coming apart though. Solution, only ride it when it's really dry out. Why would they use water soluble glue? Edit: This problem was fixed a while back. Thanks to BigTreeFallHard on Silverfish for clearing that up for me. Last edited by TGIMUNDAY; 10-10-2011 at 07:42 PM. How much would a complete go for? Plus I gotta find somewhere selling a variety. Not something I just want to look at on a site and be like I guess that'll do ze trick. I wouldn't be surprised for Original Skateboards to be there. They're located in my town and travel to a lot of the comps on the East coast. Edit: Didn't see how small it was, haha, maybe they won't be there. They can make it bigger, year by year though! Last edited by TGIMUNDAY; 08-23-2011 at 01:46 AM. Honestly, longboarding is extremely expensive, decks can be up to and past 120 bucks. Earthwing makes really quality stuff from what I've heard, for a good price. I was considering the Supermodel based on recommendations, but ended up with the FSM. I got a blank board from them and some 150mm trucks as a second set up for friends to skate with me. Got that one, looks very similar in shape to the Landyachtz Switch, at a huge price difference. You're looking at spending anywhere between 75 to 300 dollars for a complete, it's all in the quality of the products you pick. You can upgrade as you go along though, like with a regular skateboard. And if none of those tickle your fancy, here's a great site for longboard shopping. Last edited by TGIMUNDAY; 08-23-2011 at 01:55 AM. Oh, TGI made the thread. Hell yeah buddy. What can I say, I'm the man. Haha. Updated the first post again, I'll probably do more tomorrow after skating. I'm thinking of getting a long board soon, a sector 9 or whatever. I seriously need something good to cruise on, and long boards seem pretty fast/fun with the sliding as well. this is a longboard thread. Yup. $18 for a blank, $40 for a lap dance, then $2 to buy a towel to wipe away your self regret. I do it a lot.